Everyone is talking about SEO and why you should dedicate more time to it…but do you know why? What is the value of SEO to your blog? Before I talk about how you can optimize your WordPress website for SEO, you should probably know why you are doing it to begin with. Optimizing your site for search engines will improve your ranking in search engine search results. The benefit of this? You are more likely to get website visitors based on a higher search engine ranking. Think of it, how often do you click through five pages of search engine results to find what you’re looking for? Better SEO means higher search engine ranking as I mentioned above. When your website is listed higher on a search engine it gives web searchers more trust in your website content. 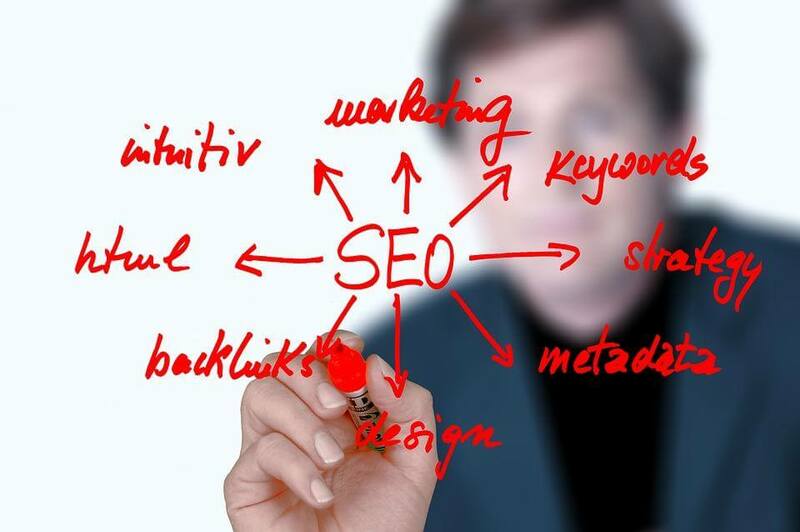 Better search engine optimization also helps your website to rank above your competitor’s websites. This means more website visitors for you, which means a wider audience, which means more clientele. Now that you know the importance of SEO, let’s talk about exactly what SEO is. I’m not talking about the HOW just yet, but I’m talking about the WHAT. 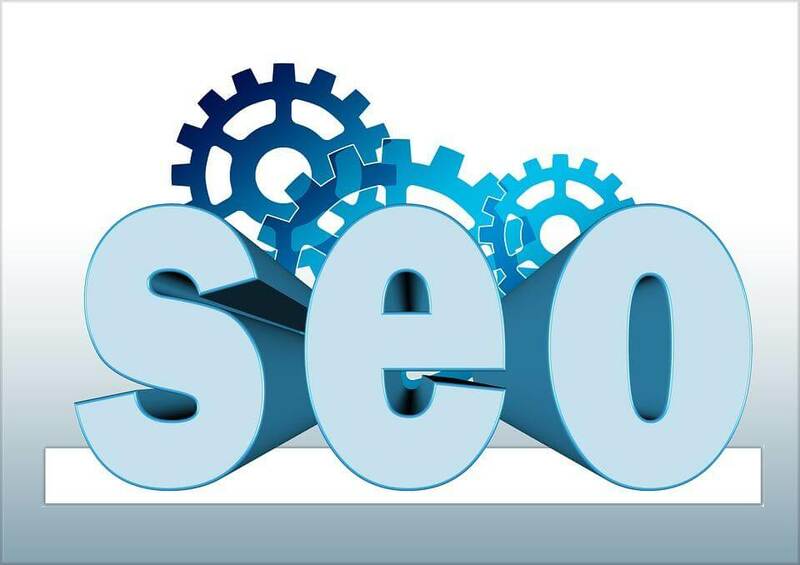 By its simplest definition, search engine optimization is the use of various techniques to communicate to search engines the relevance of your content. The better able you are to optimize your website for search engines, the better those search engines are going to be able to read and rank your content. Why SEO? Couldn’t you just pay to achieve the listings that you want or to increase your website traffic? 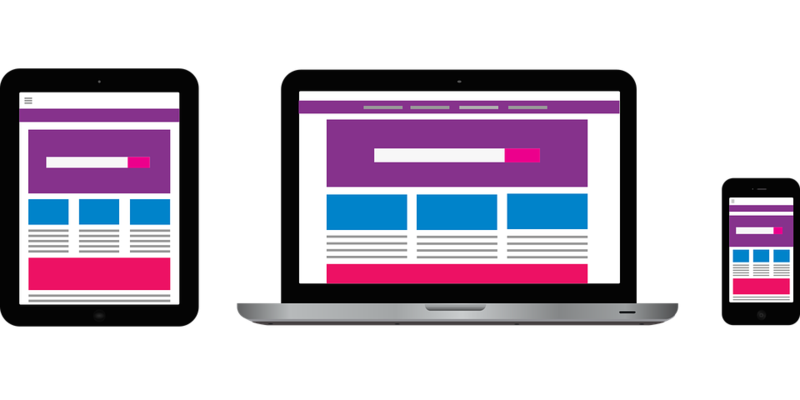 You could, but the benefit of optimizing your website for search engines is that it’s free! This means that you can increase your website audience without dipping into your advertising budget. Then, if you want to increase your audience even more, use your advertising budget to build on to your SEO traffic. When it comes to search engine optimization, it is always better to have your own domain name and hosting provider. Why? Purchasing your own domain name allows you to brand yourself, but it also allows you to incorporate keywords in your domain name. Granted, the value of keywords in a domain name is less than it once was, but there is still benefit worth taking advantage of. Using your own domain name and hosting provider also allows you more control over what visitors to your website see. Many free blogging platforms incorporate advertisements or redirect scripts into their service to offset their cost. Unfortunately, these things do not appeal to website visitors or search engines! Say, for example, you use a free platform like WordPress.com for your website. Your website address is HowtoOptimizeYourWordpressWebsite.Wordpress.com. Now, not only are you giving someone else control of your domain name, but you are leaving the possibility for one of your competitors to register HowtoOptimizeYourWordpressWebsite.com. When you have a domain name that incorporates your specific keyword phrase, the chances are that you are going to wind up ranked higher than a website offering similar content with a non-relevant domain name. Most WordPress themes these days have the responsive capability built in, but not all of them do. A responsive layout is a layout (theme) that will automatically “reformat” itself so that it is visually optimized for the device you are viewing it on. For example, a website on your desktop may have a navigation menu all the way across the top of the site. On a mobile phone, however, that menu may be collapsed since there is much less viewing area on a phone screen. Keep in mind here, that just because a WordPress theme has a responsive format capability, does not mean that it is enabled. Some themes will require you to enable responsiveness in the backend of your blog! Also, keep in mind that a responsive theme isn’t always going to be free of display errors, so it’s always best to check the mobile responsiveness of your site using Google’s Mobile Testing Tool. Subscription boxes are another must for your website. Placing a subscription box in a prominent place on your site encourages return visitors to your site. How? 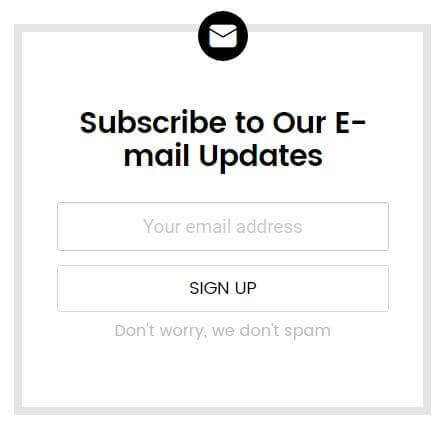 Because when someone visits your site and is interested in your content they will be compelled to sign up for email updates. This allows you to reach out to them and invite them back to your site when they have forgotten you or can’t remember your website URL. How does a subscription box help your SEO? Because regularly sent e-mail newsletters will keep visitors coming back to your site. Can an E-Mail Subscription Box Hurt Your SEO? If you use popup newsletter subscription boxes rather than static boxes on your sidebar, there’s a chance you could be penalized by search engines. Search engines like Google see these popups as intrusive, they refer to the as “intrusive interstitials” and see them as junk pop-ups that interfere with the user experience. The possibility of being penalized isn’t the only reason to avoid using a popup subscription box, though. Pop-ups of any kind REALLY irritate your website visitors – the last thing you want to do if you want people to keep coming back to your site! If you have been around the web for a while, then you are familiar with the term “link farm” or “banner farm”. These were websites that were loaded with links and banners that led to other websites effectively leaking out traffic. While link farms or banner farms aren’t as common as they once were, it is still possible to over-commercialize or over-widgetize your site. – ANYTHING that does not add relevant information or content to your site is unnecessary. – Traffic “leaks” should be kept to a minimum. – Information first, sales second. Just remember, if there’s no value to something, it doesn’t belong on your site. Your goal is to capture your audience and keep them for as long as possible. Yes, you likely want to make money off your site, but when you build your site around making money rather than quality content you run into problems. Not only are readers going to find little of value in your site, but search engines will do the same thing. Your content is king, it gives your site its rank and value in everyone’s eyes. I mentioned the importance of speed above when talking about image optimization. It isn’t only image size that contributes to the speed of your blog, however. Begin by testing the speed of your site by using a website like Pingdom. By pinging your site from a specific location, you will be able to determine whether your website load time is lagging. If your site load time is lagging, this does not bode well for potential visitors to your site so you will need to make some tweaks. Begin by installing a cache plugin. A cache plugin like WP Rocket will reduce the load time of your site by creating a static version of content for visitors to view. This eliminated the need for your site to deliver dynamic content every time someone loads a page of your site. Rather, this only requires new content to be pulled dynamically and reduces the load on your site dramatically. Your host is also going to play into the load speed of your site. If for example, you have the very cheapest hosting package with the cheapest host, then you are likely to be running at a low speed. The reason for this is because these types of hosting packages allow for many many clients to host their data on that same server. This sheer amount of data will bog down the server and cause your site to run slower. Of course, we can’t all afford a dedicated server, but use the best hosting service for your site that you can afford. No, that doesn’t mean you have to purchase the best hosting package if all you are running is a personal blog – that’s just overkill! But estimate your resource usage and plan accordingly. Additionally, certain hosting companies like MaxCDN, also offer content delivery networks which allow content cache’s which increase your site performance even more. Permalinks are the permanent URL’s that your blog uses to present content. The structure of these links can be used to your benefit for search engine optimization. This information tells search engines as well as WordPress where to find your blog post – think of it as an address of a house. Each post gets its own address…but wouldn’t it be better if each post not only served as an address but also served to tell you who is living at that address? This is precisely what you need to do and you do it by changing your permalink structure. 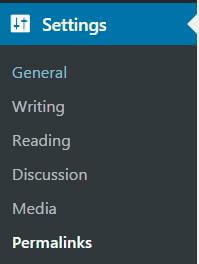 To change your permalink structure, locate the “settings” menu on the left side of your WordPress dashboard. Open this menu and select “Permalinks”. From here you will be taken to a panel where you can make various changes to your permalink structure. There are six common permalink setting options listed on this page. The default setting tells search engines nothing about what it can find at your post address, so that does nothing for your search engine presence. Ideally, you want to select a permalink structure that gives search engines your post name. This provides pertinent information without being overly long so long as you optimize your post titles. Some WordPress users choose to customize their permalink structure to include category names, but this isn’t necessary and causes overly lengthy link structures. 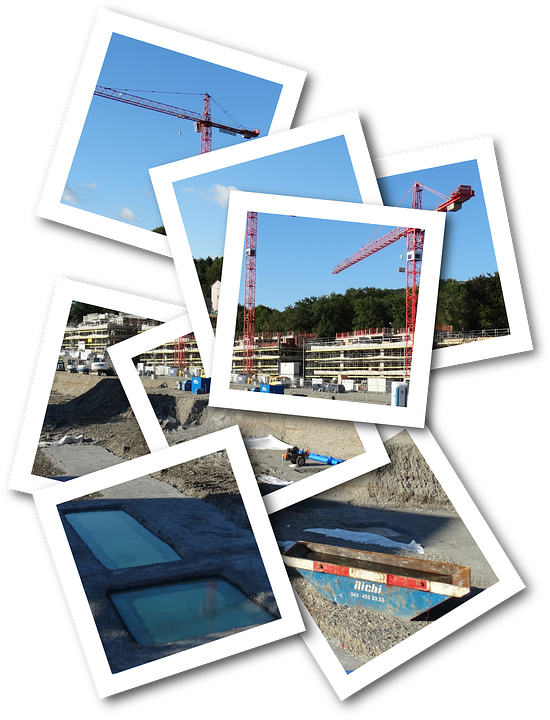 Note: Keep in mind that when you change permalink structures you are changing the address of existing posts. Unless you create a redirect within your .htaccess file any existing links to your old post addresses are going to come up as “page not found.” Think of it as moving without telling your postal carrier. Breadcrumbs are another blogging feature that is being built into blog theme options. They are beneficial both to your website readers as well as to search engines that are indexing your site. Breadcrumbs are link structures that display at the top of a page that allows website visitors to track their “place” on your site. In the example above, this breadcrumb link series is found at the top of an article titled “The Benefits of Fish Oil for Dogs”. Tracking backward, this article is located within the “The Classroom” category and the “Diet and Nutrition” subcategory. This series of links creates a trail of “breadcrumbs” that the reader can follow to find their way through other areas of your site. What is the Point of Breadcrumbs? When your posts are titled with SEO titles, breadcrumbs serve multiple purposes. Breadcrumbs are another way to create a “sitemap” for search engines to relate pages and posts of your site to one another. Breadcrumbs also strengthen your website’s internal linking structure to help readers find their way plus rank you higher in the eyes of a search engine. Breadcrumbs also help to create a context for the content of your post or website page by linking back to related categories. As I mentioned above, many themes these days build the option for breadcrumbs into the theme. This makes enabling and disabling them as simple as selecting a toggle switch. If your theme does not offer breadcrumbs, however, you can utilize the breadcrumbs option that is built into YOAST. This will involve making an edit to your theme, but it’s a simple edit that can be done in no time. When you install YOAST, make sure to verify your webmaster tools. This includes signing up for Google Search Console. Google Search Console is a tool that will allow you to gather data and diagnostics on your website based on Google searches. For example, you will be able to analyze the clicks that come to your site through Google Search and test whether Google is properly able to understand the content that you have presented on your website. The Google Search Console will also check for any issues or errors on your site that may be impacting your site function and search engine results. Sign up for Google Search Console here. Once signed up, utilize the HTML tag verification by copying the Search Console code provided and pasting it into the Webmaster Tools section of Yoast on your site. Now click save and head back to Google Search Console to verify your site. Just be aware, your data won’t be visible right away. 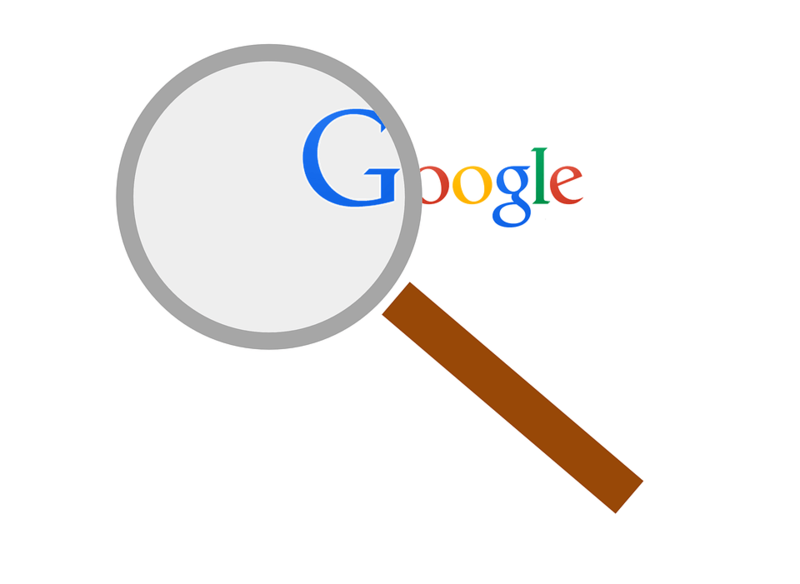 Search engines need a little time to gather information! 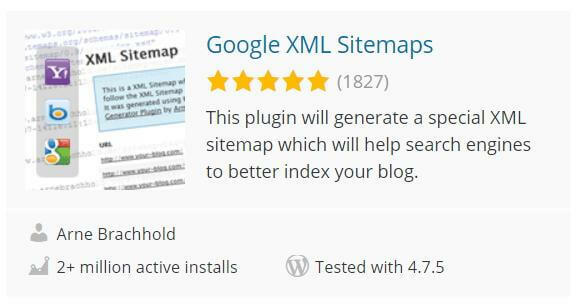 I mentioned sitemaps briefly earlier when talking about the YOAST plugin. The YOAST plug-in tool is something that you should be using to optimize your WordPress site anyway, so there is no point utilizing another sitemap tool. If you do want to seek out another sitemap tool, however, Google XML Sitemaps is a simple to use sitemap plugin. A “sitemap” is pretty self-explanatory, it is a map of your site that provides the location, link structure, and information about the content on your site. While visitors to your site may find some use in a sitemap, it is unlikely that they will go looking for it. What will go looking for your sitemap, however, is search engine spiders. When you create a sitemap, you provide a map of your content that search engines can use to link your pages together. Think of your website as a series of platforms. Each page or post is a platform of its own. A search engine spider may find one platform, but if you create a sitemap that links these platforms together like a rope ladder, the spider can find its way to multiple platforms. As the spider finds its way from platform to platform it indexes this linked content that may otherwise have been inaccessible. How Do You Create a Sitemap? Creating a sitemap really is as simple as choosing the plugin you want to use, installing it and clicking the “build sitemap” button. It’s a quick, but valuable process to optimization of your site. A good SPAM filter is important for a number of reasons. I prefer Akismet as do most other WordPress bloggers. 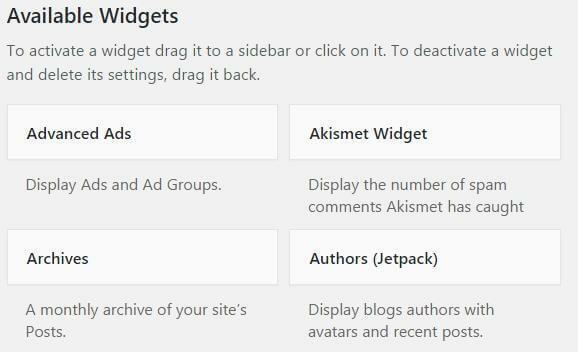 Akismet is a free downloadable plugin for individual bloggers but requires a purchased key code for business or commercial sites. Installing Akismet is as simple as downloading and activating the plugin and requesting the activation key via the Akismet website. But Why Does a SPAM Filter Matter? Audience interaction is a good thing for your blog, but only when that interaction provides insight, information, and does not leak your traffic to an unrelated website. Sure, you can turn on comment approval meaning that you must approve every comment before it posts, but this creates a lot of work for you when spammers do hit your site. 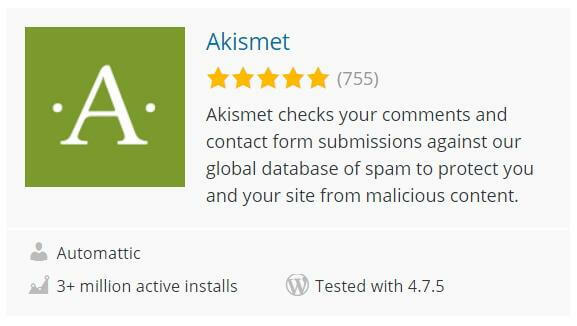 Using a plugin like Akismet will automatically scan comments and flag comments that have classic patterns of SPAM. This will cut down the time that you spend weeding through SPAM comments, prevent authentic commenters having to weed through SPAM comments and stop unnecessary irrelevant traffic leaks. More control of your content and your traffic to your site is important in establishing yourself as an authority site that does not appear to search engines to be a “link farm”. Sometimes, when search engines crawl your website, they run into errors. These errors can vary widely, but they all influence how the search engine crawls and indexes your content. For this reason, it’s important to note any search engine crawl errors and fix them as soon as possible. How Do You Know If You Have Crawl Errors? Google offers a tool to check your site for crawl errors, but before you can use it you must add your “property” to your Google account. Add your property by visiting this link and clicking the “Add property now” button at the bottom of the page. If you are not already logged in to your Google account, you will be asked to do so. Next, you are redirected to a page where you can “Add A Property” if you do not already have your website verified under your Google account. After adding your “property” you will then need to verify that you own that site. This process is as simple as uploading an HTML file to your site. If you only just verified your site with Google it will take a while before you can run the crawl error report and fix errors generated by your site. If you already have your site verified, the Google Crawl Errors report will direct you to errors on your site and you should remedy them as soon as you can. Crawl errors slow down the indexing of your site and can damage your site’s reputation. One of the most important things you can do for your site, your readers, your search engine presence, and yourself, is to lock down your site’s security. There are a variety of WordPress security plugins and programs available. The one pictured above, and one I like to use, is iThemes Security Pro. The reason I like this plugin so much is that it makes locking down your site easy but it does a thorough job of keeping hackers out. The dynamic nature of WordPress means that changes and updates are regularly being made. These changes are often made to advance features, but they are also made to close loopholes in code that can allow hackers access to your site through the “backdoor”. Such backdoors can be found when WordPress versions and plugins are not kept updated, but they can also be found when amateur bloggers leave “back doors” open. This can happen in many ways such as setting incorrect file permissions and allowing access to certain pages within your WordPress site. When hackers manage to access your site through a backdoor, they can plant viruses, take your site offline, or steal information. Of course, this isn’t good for you or your website visitors, but it’s also bad for your SEO. When your site is seen as harboring malware or being a security risk many search engines will blacklist it or redirect users away from your site with a security warning. Obviously, this is not something you want, so make sure to install a security plugin and lock down all of those potential entry points. When you began your WordPress website, you undoubtedly had a topic in mind. Every piece of information you add to your website should be related to that topic in some way. This is what makes your site relevant and an authority in your arena. The best way to target your content is by selecting keywords that relate to your topic and using these keywords as topics of your posts and pages. Keywords don’t just serve to provide relevant content and increase your authority, however, they also help to rank your site above others. The keywords you target will determine the traffic that your website receives and consequently how it ranks in search engines. Ideally, you want to select a keyword that has low competition but high search numbers. This guarantees that you are providing information that people are looking for so you have an audience for your site. This also creates fewer competing sites for potential visitors to go to and increases your popularity for that topic. For example, if you write a post targeting “Search Engine Optimization” as a keyword phrase, you will find that you have more competition than you could imagine and your post is likely to get lost in the shuffle. If instead, you write a post targeting “Search Engine Optimization for Small Business Blogs” you have less competition for your key phrase, but you still provide an audience with relevant information. How Do You Know What Keywords Are Best? There are many keyword selection tools to choose from, many of which are paid membership options. Google, however, remains the most popular source of keyword research. The Google keyword research tool has changed from what it used to be, but the new keyword planner offers much more information than it used to. So long as you are logged in to your Google account, you will have access to all of these keyword research tools. Using any one of these tools, you can search for keywords relevant to your niche and save a list of valuable keywords to your site. Firstly, your keywords MUST be relevant. Second, your keywords MUST have relatively high search volume (meaning that it is a term popularly searched by search engine visitors). Thirdly, the competition for your keywords should be low. This decreases your competition and increases your likelihood of ranking highly for these terms in search engines. Another thing to take into consideration is whether or not you will be bidding on these keywords using Google AdSense. If you will, then you also need to pay attention to the cost per click of the keywords in question. You obviously need to keep your costs as low as possible to get the most traffic for your budget. When you target keywords in your blog or website, there are only so many times you can focus on a single keyword. This is where a thesaurus comes in handy! 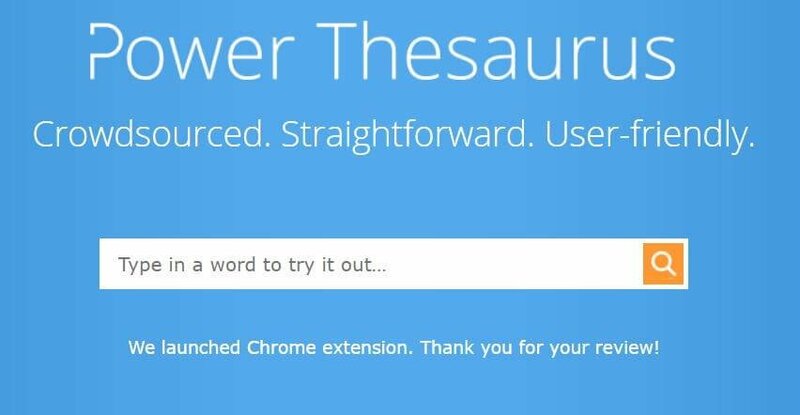 I love Power Thesaurus because it offers an incredible database of synonyms to choose from. Use this site to choose keywords to target in your blog posts not just to find popular keywords with low competition, but also to broaden your audience. For example, a blog about “gas prices” may broaden its audience by also targeting “petrol prices”. This instantaneously broadens your audience to include European suffers as well as those in America. Widening the scope of your keyword terms also creates a broader base on which search engines can rank your site’s authority. The more relevant topics you cover, the more of an authority your site will appear to be. There are plenty of search engine optimization tools out there for WordPress, but Yoast SEO is one of the most comprehensive. 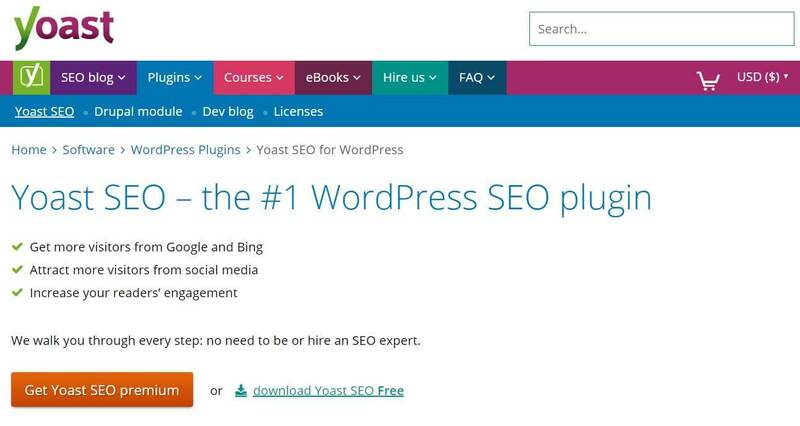 The Yoast SEO plugin lets you easily optimize your blog pages AND posts based on targeted keywords or phrases and it assesses the readability of your content. There are two versions of Yoast SEO available – the free version and the premium (available for $99). Unlike most plug-ins that offer premium versions, the free version of Yoast is fully functional and provides all of the basic functions you need to get started. The premium version of the plugin offers these basic functions in addition to some more advanced features. What can Yoast do for your WordPress site? Yoast allows you to set a target keyword and measures the frequency with which you use that keyword. Yoast lets you set your search engine post or page title and description to customize them for optimal function. Yoast also gives you the option to turn off Google indexing of specific posts and pages so that they are not included in search engine results. Yoast can give you better control of outgoing links from your site too. With one click, you can tell Google not to follow any links that are present on your page. Yoast uses the Flesch Reading Ease score to analyze the readability of your content. This ensures that human visitors to your site can easily read your content. Yoast is also able to prevent you from displaying duplicate content on different URLs. This is an important feature because many search engines will penalize your site for duplicate content errors. Yoast gives you more control over the breadcrumbs displayed on your WordPress site. 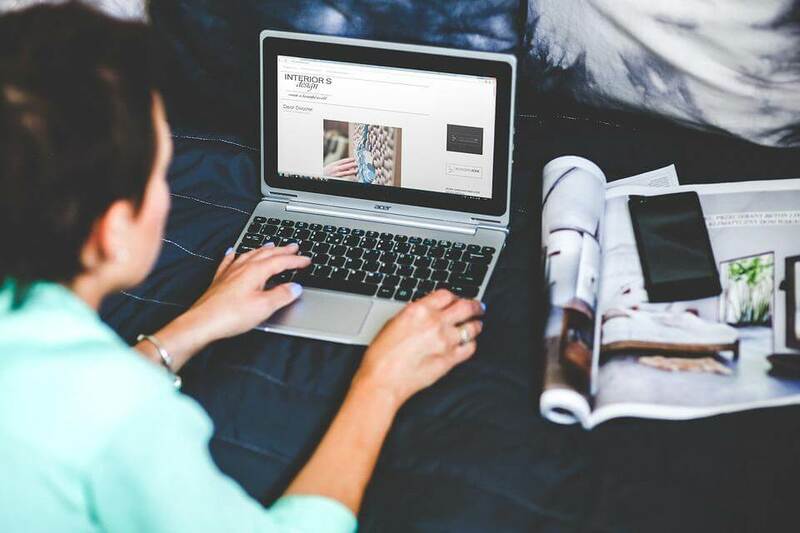 This customization will make content easier to follow for readers as well as search engines. Multiple category cleanup is another option with Yoast. This allows you to set a single primary category for a post or page that belongs in multiple categories. This lets you target the single, most important category for search engine indexing. Yoast also includes a sitemap feature. Sitemaps are important because they allow search engines to find pages within your website, not just your website itself. With Yoast, you can also add enhancers to your RSS feed to customize it with additional backlinks to your site. Lastly, the free version of YOAST also allows you to access and edit your robots.txt and .htaccess files directly from the backend of your blog. You can create and manage redirects for your website directly from the backend of your blog. You can choose multiple keywords for a single post and optimize your post to highlight those keywords for better SEO ranking. Premium YOAST also gives you a preview of how your posts will appear on your social network shares so that you can make sure they are visually appealing and don’t pull up errors. Premium YOAST also creates a better system for internal linking where common words can be linked to post suggestions within your blog. An insight feature is also built into premium YOAST. 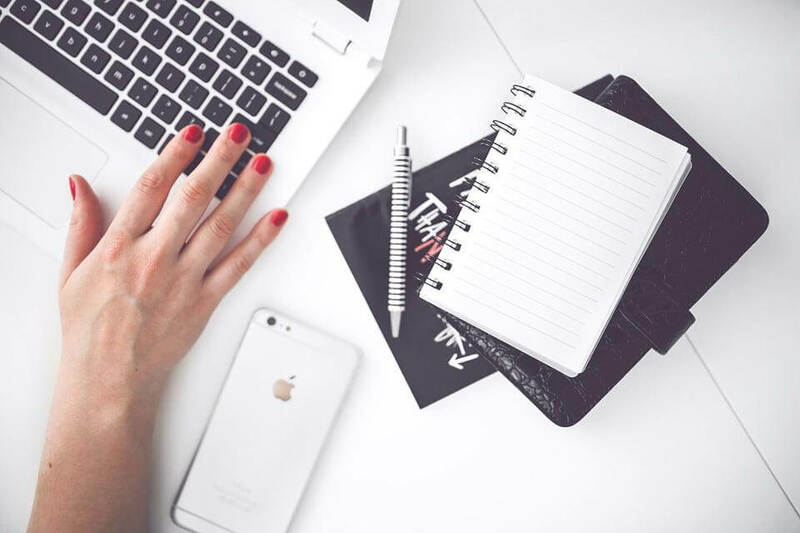 This allows you to track the five most used words or phrases in your post so that you can ensure that the post stays on track with the topic at hand! Relevance is IMPORTANT! You can purchase premium YOAST for $69 per site on their website. Original content is what makes a website. Original content is what gives your blog value and makes your site stand apart from the rest. Without original content, you have nothing to offer your audience that they can’t find elsewhere. Why should you care? Because when two sites offer the same content, website viewers don’t care if they visit your site or the other one because either way, they get the content they came for. Original content isn’t only about your readers though, it also affects how a search engine views your site. It’s not that duplicate content hurts your website ranking, so much as original content improves it. When you manually curate your own content, you ensure that the content you are writing is relevant to your niche and your audience. This is important to search engines because some search engines rank your website based on the relevance of content. Remember how we talked about a sitemap creating links within your site for search engines to follow when crawling your site? A related posts plugin serves a similar purpose by connecting similar posts within your blog and creating links between them. 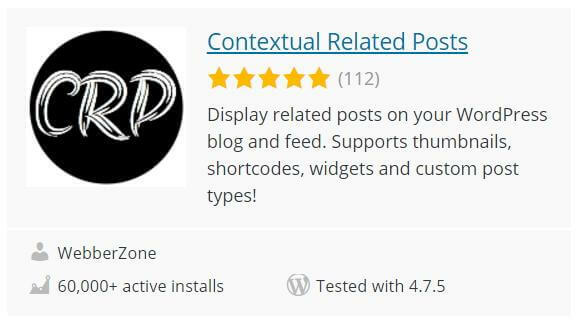 Using a related posts plugin like the “Contextual Related Posts” plugin pictured above creates links to relevant content which increase your presence as an authority site. Using a related posts plugin also encourages readers of your site to stay on your site for longer periods of time. This is a direct result of offering readers additional information about a topic that they are interested in without asking them to search it out themselves. Do You Have to Have a Related Posts Plugin? As more developers are coming out with their own themes, the related post option is becoming more common as a built-in function. Currently, this seems only to be the case for purchased premium themes, but it’s always worth checking your theme to see if the function is available before installing a plugin. The fewer plugins you install on your site the less opportunity there is for exploits. Fewer plugins also mean less chance that things will become incompatible when WordPress upgrades to a new version. Write Content Like You Mean It! 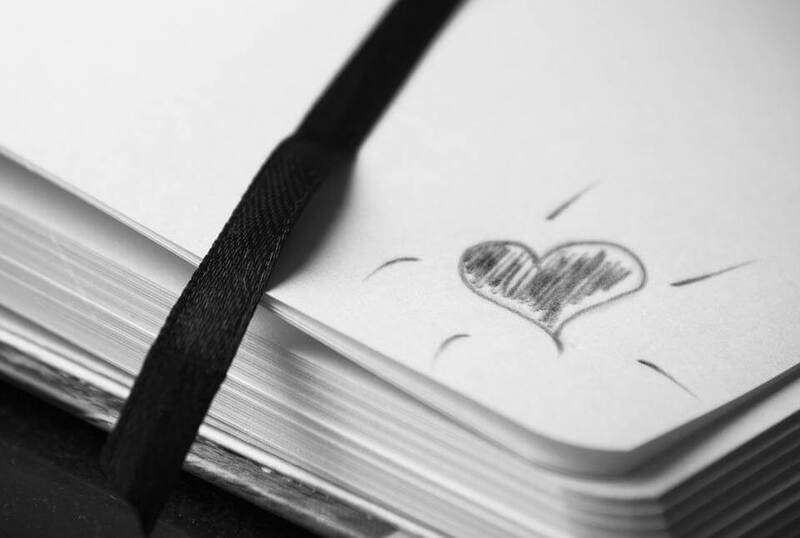 Originality is key when it comes to content, but so too is having your heart in what you write. I’ve already talked about how regular updates with valuable material plays into your search engine ranking and popularity. How does having a passion for what you write play into this? Because in order to write about something regularly AND keep readers engaged, you need to have a passion for the topic you are writing about. Your blog is about model airplanes. The people who read your blog like model airplanes. You don’t like model airplanes. Since you don’t like them, you are unlikely to be up to date with trends in the hobby world, you are also unlikely to be knowledgeable about specifics of the hobby. If, however, you are passionate about model airplanes yourself, your passion will show through your content. This means that your content will appeal to your readers and keep them coming back for more. It also means that you will have a steady supply of content to keep your site updated regularly. In addition to original content, it’s important to regularly update your WordPress website with new original content. The more regularly you update your WordPress website with new original content, the more often search engines will crawl your site to index it. 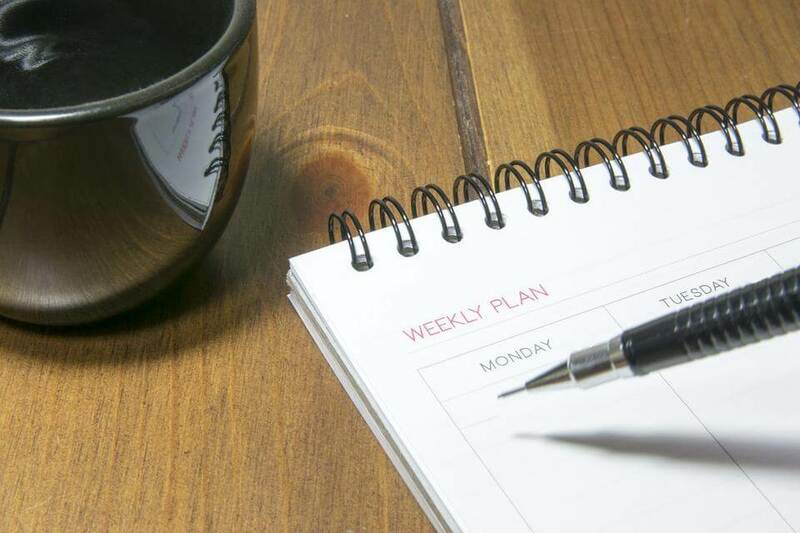 Find a schedule for posting to your site and stick with it. Regular updates are important too because they provide recent relevant content rather than outdated content. While search engines may not penalize you for outdated information, your readers will. YOAST gives you the opportunity to create your own Search Engine Optimized titles for both pages and posts – USE IT! Make sure when using the YOAST SEO title feature that you stick within the character limit and that you use your keyword or phrase in the title. It is best to keep your keyword/phrase at the beginning of your title whenever possible, although if this doesn’t make sense, don’t force it. While you want your SEO titles to be as optimized as possible, you also don’t want to keyword stuff to where your content looks like nonsense. This title gets straight to the point, is of optimal length, makes sense, and tells your reader exactly what to expect. Note here that your keyword term is not at the beginning of the title, your keywords are separated throughout the title and you are wasting characters on unproductive words (“nifty”). Headings are valuable to post content for a number of reasons. 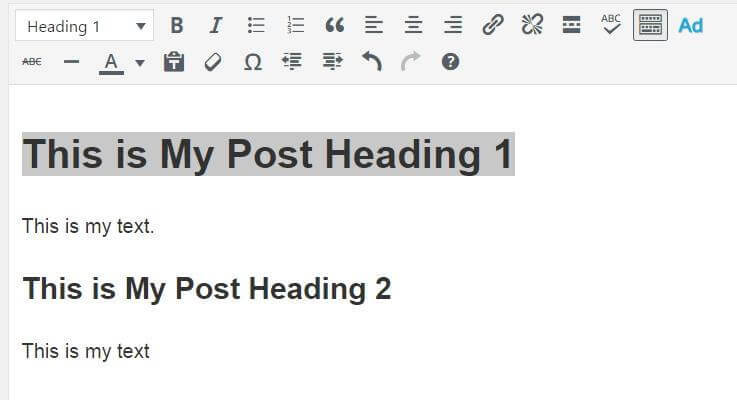 Firstly, separating your post by using different heading formats makes your content easier to read for your website visitors. Heading formats are not as crucial as they once were when it comes to search engine value, but that isn’t to say that they aren’t important. 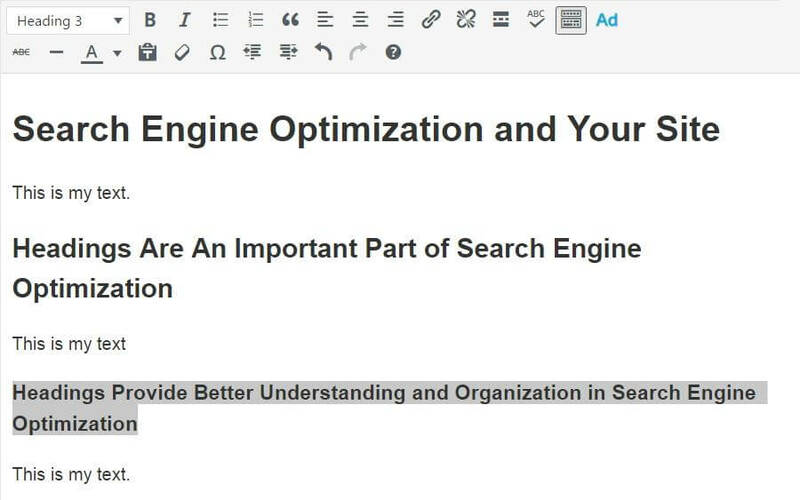 Just as you use headings to give your readers the basic gist of a paragraph, you do the same for search engines. Utilizing the Heading 1, Heading 2, and Heading 3 options, we provide a hierarchy of information for search engines to scan. This hierarchy tells search engines what your content is about in concise headings so that a quick scan can provide the search engine with a “roadmap” of your content. How should you use headings? A good general rule of thumb is to use Heading 1 for your category, product name, or post title. Heading 2 should be used for subheadings within your article. If your article is quite long – around 1,000 words or more – use Heading 3 to break up your content further. You can also use Heading 3 as a means of breaking up your Heading 2 paragraphs into subsections. Just make sure not to overuse headings or they will lose their effectiveness in highlighting important content. I mentioned using headers previously, but there is more to formatting your content than just using headers. Formatting includes the correct use of headings, images, captions, and subtitles. Like headings, images, captions, and subtitles help your readers to read your content by separating large amounts of text and providing visuals. These elements also make your content easier to read and index for search engines. Just remember to use these elements properly. Overuse of images will cause your page load time to lag, but it will also mean less written content. Your written content should be the main focus of your site because it provides the most information to search engines as well as readers. You may think that separating content with more paragraphs or divisions will make it more easily readable…this isn’t true. Doing this only creates confusion. Imagine trying to read a story where there is no rhyme or reason to the formatting – the content wouldn’t make sense. Use common sense and utilize these elements as they were meant to be used. The faster your website loads, the better. This means that those 3000px or 5MB images that you have been using have got to go! You can always manually compress images using an image editor before you upload, but the simplest method of optimizing your blog images is to use an image optimizer plugin. I like reSmush.it Image Optimizer because it will automatically optimize images as you post and it will allow you to go back and optimize images that were previously uploaded without optimization. You can download the reSmush.it Image Optimizer directly through the “Add new plugin” section of your blog backend. You will be amazed at how much load time you can shave off your blog just by optimizing images and faster page load time is a plus when it comes to SEO. Internal links are links within your WordPress blog or site that redirect the reader to another page or post within your blog or site. When placing internal links on your site it’s important to utilize keywords as linking anchors to link to relevant content. For example, you may use the word “SEO Optimization” to link to the article mentioned in the last section. You would not, however, want to use a “click here” anchor text to redirect your reader to that article. Using relevant keywords as anchor text for internal links helps to create an information hierarchy within your site. This way, search engines crawling your site can plainly find content and note the relevance of that content and the information linked to it. When using internal links on your WordPress blog, make sure to limit the number of links on a single page or post. This will help to prevent your reader from being overwhelmed but it will also prevent your website from appearing to be a link farm where readers are bounced around. There is some dispute as to whether or not stop words should remain in slugs when writing blog posts. A lot of people believe that stop words should not be used in post slugs, I am not one of them. A “slug” is the URL translation of your post title. For example, a post titled “Ten Things to Do In Seattle” would have a slug “ten-things-to-do-in-seattle”. What is a “Stop Word”? A “stop word” is a commonly used word like “the” “and” “a” “an”. Why Leave Out Stop Words in Slugs? Some programs (like YOAST) give you the option to automatically leave out stop words in the slugs of your posts. They do this because it creates a shorter URL which is more memorable and focused more on keywords. Okay, it’s an odd example, but you can see that the original article title refers to two types of yogurt – strawberry and banana yogurts, where the second option refers to one – strawberry banana yogurts. Sometimes, the removal of stop words changes the meaning of your article completely and as such, it can influence your search engine ranking. If you are using a software or plugin that offers the function to remove stop words from slugs, do not enable this capability. Yoast will remind you that your slug has stop words so you do have the option of removing them when they don’t change the meaning of your content, but they aren’t automatically removed for you. Just as it’s important to use the SEO title box provided by YOAST, it’s also important to use the meta descriptions box provided by YOAST. Your meta description is the little snippet of text that displays on a search engine when your post is ranked. Some people use an overall template for their website that copy and pastes the same meta description for every page of their site, this isn’t advisable. Use your meta description as another opportunity to be precise about what each post or page of your site offers. This will increase your content relevance attracting more readers. Keep in mind that your meta description should always be between 145 and 155 characters and it should always feature your keyword phrase. Making your description relevant to the post title! Making your description grammatically correct. Concisely stating a problem and your ability to solve it. We all have “off days”. Many of us have content on our sites that was written before we were more search engine savvy. We can’t help what we didn’t know then, but we can help what we know now. Take the time to go back through your site when you can and make necessary changes to your content to make it valuable. If you have an article that offers little in terms of unique content, add to it so that it offers unique content. If you have a page that has not been optimized using YOAST, go back to that page and use the YOAST tool to make the necessary optimizations. If you have an article that wasn’t formatted using headings, go back and put headings in. If you have a large website, the chances are that you have quite a few of these things waiting for you. Of course, you want to change all of them, but this can take time. Rather than getting overwhelmed, just tackle these changes as you can and keep track of what you have yet to do. Social media networks are crucial for reaching out to a new audience, but also for increasing traffic to your blog. JetPack is a great plugin option for your blog because it provides multiple functionalities including the ability to automatically share your blog posts on social networks. 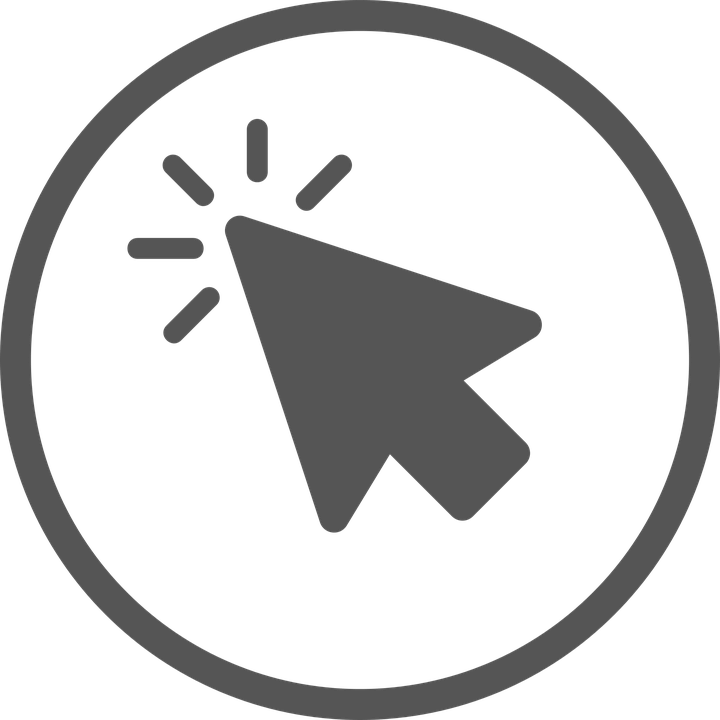 Simply download the Jetpack plugin directly from your WordPress plugins area and activate it. Once activated, go to the sidebar menu > Jetpack > Settings. From here you will set up your Jetpack settings. To set your social media sharing options so that your blog posts will publish directly to social media when published, alter your “Sharing” settings on the Jetpack Settings page. Begin by turning on the “Automatically share your posts to social networks” toggle switch. Then select the link below that says “Connect your social media accounts.” This will take you to a new window where you can connect various social networks to publish your posts to. Which Social Networks Should You Connect? Jetpack gives you the option to connect your Facebook, Twitter, Google +, LinkedIn, Tumblr, and Path accounts. Should you connect all of these networks? This is going to depend on your content. Use your common sense when connecting your social networks. You want to increase visitors to your blog and expose your content, but you also don’t want to appear as though you are simply spamming content. Isn’t a wider audience always better? Not necessarily. A larger viewing audience is great for SEO, but your reputation is important too. A website with a poor reputation is not going to be viewed favorably by potential readers or search engines. Your niche is what determines which networks will be most beneficial to you for social media sharing. Ask yourself if the network you are considering holds readers who may be interested in your content. For example: Connecting to LinkedIn may be beneficial if you run a blog dedicated to resume improvement or recruiting. Connecting to LinkedIn may not be as beneficial if you run a site like College Humor. In fact, it is likely to get you flagged for spamming content. The key here is to utilize social networks for their respective audiences. Facebook: Facebook works well for viral content, local content, informative content, and interactive content. Twitter: Twitter also works well for viral content, local content and informative content. Google +: Google + is a platform that can work well for any type of content. LinkedIn: LinkedIn is more of a professional network, this means that you are best to target only informative or local content that could be beneficial to your audience. Tumblr: Tumblr relies on picture related content. So long as you target picture related content you would do well to connect your Tumblr account to your blog. Path: Path is best for targeting picture content, but of all social networks it is the one to be least concerned with as it limits contacts thereby limiting your audience. Purchasing linkbacks to your WordPress site can be helpful, but natural linking is much more powerful. A purchased link is a link that you buy. Common sense dictates that you would purchase a link on a relevant website…or at least it should. Links on relevant websites are valuable because they increase your authority in your niche. How? Because a website that is relevant to that niche is linking back to you. This means that you can purchase a link back to your WordPress site on another relevant site and it will have value. When is purchasing links a bad thing? Many websites that sell link backs are created for the purpose of selling links, this means that they are mostly low-quality sites. Search engines are able to tag these sites and penalize them for being link farms with poor quality content. If you purchase links on these sites, your site is then tagged as being linked by an untrustworthy website. How does this affect you? It has the potential of knocking down the rank of your site and how trustworthy it is seen as being. So, if you are considering purchasing links on other websites, it’s important to research the quality of the site. Is the site littered with links to other sites? Does the site offer original content that is of value to your niche? Does the site author regularly update content? Is the site author respected in the community? Natural links are links that are “natural” to the flow of content on a site. When a website links to your site with a natural link, your site is viewed as a relevant authority. Your site is a site that offers more in-depth information to readers of the linking site and can expand on their knowledge. Can a natural link be a purchased link? Yes, BUT you won’t find this type of link in an advertising agency or a bulk link sale website. To find a natural link that you can purchase, you need to do the legwork and even then, owners of the site are going to be reluctant to sell a spot on their site. Writing a guest article for a website is a great way to get a natural link on an authority website. This offers quality and original content for the website linking back to you and it gives you a link back to your site without that link appearing as “spam”. Another method of natural linking is to use comments; however, this is getting increasingly difficult to do because so many spammers use comment sections for link spamming. It is still possible to share links through comments, but when you do so it’s crucial that the link you share is relevant to the article you comment on. It is also important that the link you share offers something that the website you are commenting on does not. Your aim here is to draw readers to your website but without “poaching” readers. You are looking to build relationships with other authority sites in your niche that can be beneficial to you both. I personally use both analytics and Jetpack stats on my WordPress sites. The Jetpack plugin allows me instant access to statistics in my dashboard and provides a backup point for site stats. Google Analytics, however, is also a valuable source of website statistics. Google Analytics is a powerful and free tool capable of tracking large amounts of data. Most importantly, however, Google Analytics connects directly to the other Google webmaster tools. 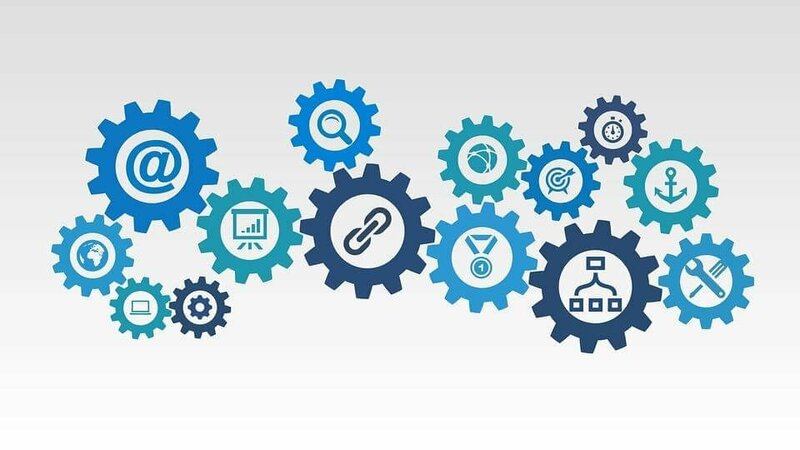 This allows you to take your website analytics and connect them directly to keyword research, AdWords purchasing and other data offered by Google Webmaster solution. Google Analytics is used mainly as a tracking tool to monitor website traffic. It allows you to see what information on your site is most popular, how much traffic your site is getting, what country most of your website visitors are coming from, how long visitors are spending on your site, and where they are coming from among other things. Why is this information important? Because it allows you to better target your content, your website visitors, and quantify your website. These things allow you to increase your search engine presence by creating more relevant content that appeals more to your audience. There are so many tools, tricks, and tips that you can implement to optimize your WordPress website and I have only touched upon the most important in this guide. I encourage you to use this guide as a starting point to set you up for SEO success. Once you have followed the steps outlined in my guide, keep learning, keep researching, and keep updating your site and you will continue to grow your search engine presence. If you prefer to have a professional optimize your WordPress and manage Search optimization for you, contact me for a free consultation.